Sergeant Sebastian Gallegos is standing in the middle of the kitchen, staring at a carton of eggs on the counter. "You can do this," his occupational therapist, Lisa Smurr, tells him. "It's too easy." He exhales and reaches toward the carton with his robotic right arm, which beeps three times before the pincer at the end of it closes around an egg. As he carries the egg toward a mixing bowl, the pincer tightens, cracking the shell. Gallegos's sense of humor, however, is still intact. "At least I didn't get my hands dirty," he says. On the second try, the broad-shouldered Marine picks up an egg with his prosthetic and breaks it cleanly into the bowl. After whisking it, he slowly, but flawlessly, cooks it in a pan. The exercise is part confidence builder, part rehabilitation, as Gallegos learns to use the complicated prosthetic he received only two weeks before. The kitchen sits on the top floor of the Center for the Intrepid, a state-of-the-art, $50 million rehabilitation facility for amputees and patients with salvaged limbs, at Brooke Army Medical Center (BAMC) outside San Antonio. 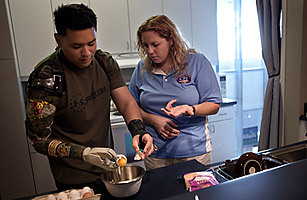 For wounded soldiers like Gallegos, who had his arm blown off by a roadside bomb in Sanguin, Afghanistan, making eggs counts as one of the many small victories being won as they return to America and fight a third war, which is likely to last longer and cost as much as the conflicts in Iraq and Afghanistan. Treating the troops who were injured there is expected to cost as much as $867 billion in the coming decades as the focus shifts from critical injuries to long-term treatment for traumatic brain injury and post traumatic stress disorder. Seriously injured troops, including those with severe burns and mangled limbs, are coming to bases like this one where teams of doctors, physical therapists and prosthetic engineers push the warriors, as they call them, to be as active as they were before their injuries. Many of the patients with missing limbs are training for triathlons; others work out on climbing walls and in an indoor surfing tank. They spur each other on during training sessions and engage in a makeshift form of group therapy as they go about putting their lives back together. Behind the security walls separating the post from San Antonio, BAMC (pronounced bam-see) looks like a college campus. Palm trees line walkways through the green spaces, and the barracks even look a bit like freshman dorms. But stand in one place and you'll see young men  there are very few female patients here  walk or jog by with metal devices where one or both legs should be. Some push themselves in wheel chairs; others have braces on their lower legs. At any given time, there are about 600 wounded warriors at various levels of treatment, and many of them are headed to the Center for the Intrepid for an appointment or a grueling therapy session. The center, which opened in 2007, is a one-stop shop for amputees, who start rebuilding their strength before their surgical incisions have fully healed. A team of on-site prosthetists makes everything from simple carbon fiber arms and legs to complex robotic devices like the one Gallegos is trying to master. Physical therapists use infrared sensors to evaluate how patients are walking on their new legs, then adjust the prosthetics accordingly. Amputees also get on boogie boards in the Flow Rider, an indoor surfing tank like the kind found on cruise ships, to help learn to balance and work on core strength. The fourth-floor therapy apartment where Gallegos is scrambling eggs looks like a page from an Ikea catalogue. There's a bedroom, living room, kitchen and washer and dryer, and occupational therapists use everyday chores  like cooking or making a bed  to teach wounded troops to use their prosthetic limbs. For Gallegos, learning to make a simple meal has a special significance. "My wife does a lot for me, so I tried to make eggs for her," he says of a breakfast he attempted before he got his fancy new prosthetic. "I tried to scramble them in the pan and I couldn't hold it, so I got eggs all over the kitchen. I got shells in the eggs and I was trying to pick them out, but they were already cooking." After being fitted with the robotic arm, he decided to try again. See TIME's photoessay, "An Army Apart: Disconnect Between the Public and the Military."